A photo a day throughout January, to celebrate all that is good about this time of year. 22/31: Buying Seville oranges to make marmalade. 23/31: An ice cold, bone dry, blue sky winter day when the grass is crunchy underfoot and the frozen puddles crack when you walk on them. 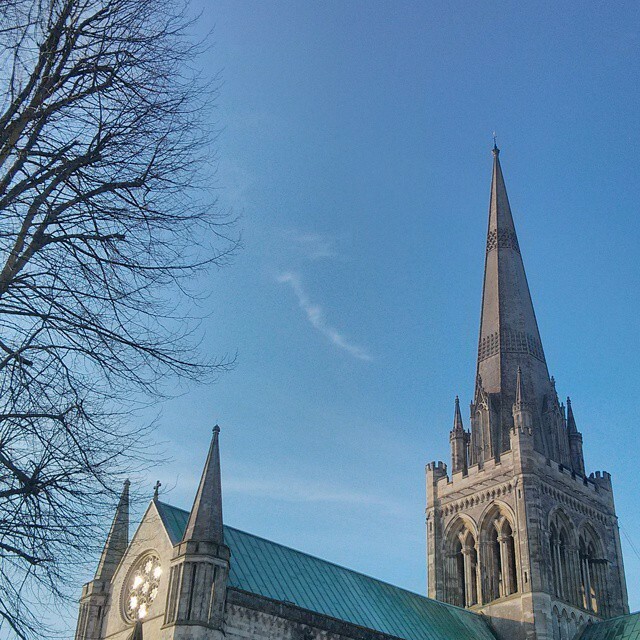 This is a photo of Chichester Cathedral taken on my phone that day. 24/31: Wearing my new handmade scarf to London and feeling simultaneously snug and smug. When I first wear something I've made I feel like telling everyone I see: "Look, do you like my scarf? What do you think of it? I made it! Yes, I made it. Myself! " Luckily I don't do that. 25/31: The weak, watery, winter light breaking through the clouds on a Sunday afternoon walk. 26/31: Making marmalade. It took ages to set but filled the kitchen with warm, orange-scented steam as it got dark outside. 27/31: Bare branches. I never tire of these, they're just so beautiful. It sounds daft, but I notice the trees more, not less, when they are without their leaves. 28/31: A lunch of tomato soup (not yet in the bowl), bread and cheese, eaten indoors with all the lights on while it rained outside. Are you bored of this yet? I hope not, I'm enjoying it! Only three more days to go which is good as I don't think I could sustain this kind of challenge for longer than a month. Still no snow here, despite many a weather forecaster teasing us with pictures of snow clouds over Hampshire. Enjoy your weekends. These last few days have been full, but it's been a good kind of sociable-busy, not stressed-busy. 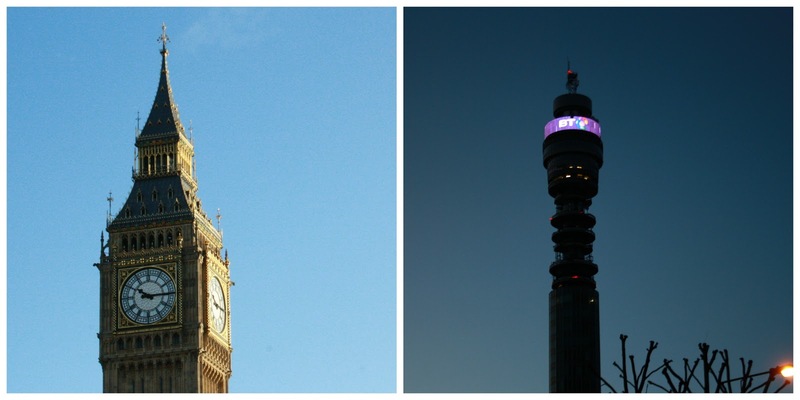 I've been day tripping to London. My friend Abigail and I try to meet there at least once a year; we call our jaunts "Mother's Respite Days" and they usually involve some kind of gallery or museum visit, then food, then shopping, then more food. I am clueless in London and leave the planning and navigation to Abigail who knows the city really well. I saw a funny thing while I was there - selfie sticks! Extensions for the camera on your phone, so that you can take a good picture of yourself in front of famous monuments. I realise I'm probably one of those annoying people who wander around capital cities looking up at things saying "Oh wow, look at that roofline/cloud/tree!" while taking a photo, but still....I do not have a selfie stick. I will keep what dignity I still have. Anyway, it was a brilliant day. Absolutely freezing cold, but sunny and dry. We visited the National Portrait Gallery and it was wonderful, and busy as you'd expect, but oh, the Real Tudors display was so good, and especially interesting to me after watching Wolf Hall on tv last week, imagining those old paintings as real people. But for me, the absolute shining star of the visit (and possibly my whole day) was Grayson Perry's Who Are You? tapestry. Joyful, exuberant, interesting, witty and impossible to photograph. It captures all that is good and unique about being from this country. These little trees say "British Museum" and "British Library". I love that. So rich, so many details. We spent a long time in the Tatty Devine shop. Huge restraint was exercised and one small purchase was made. Closer to home we had a very nice family walk around a local millpond. 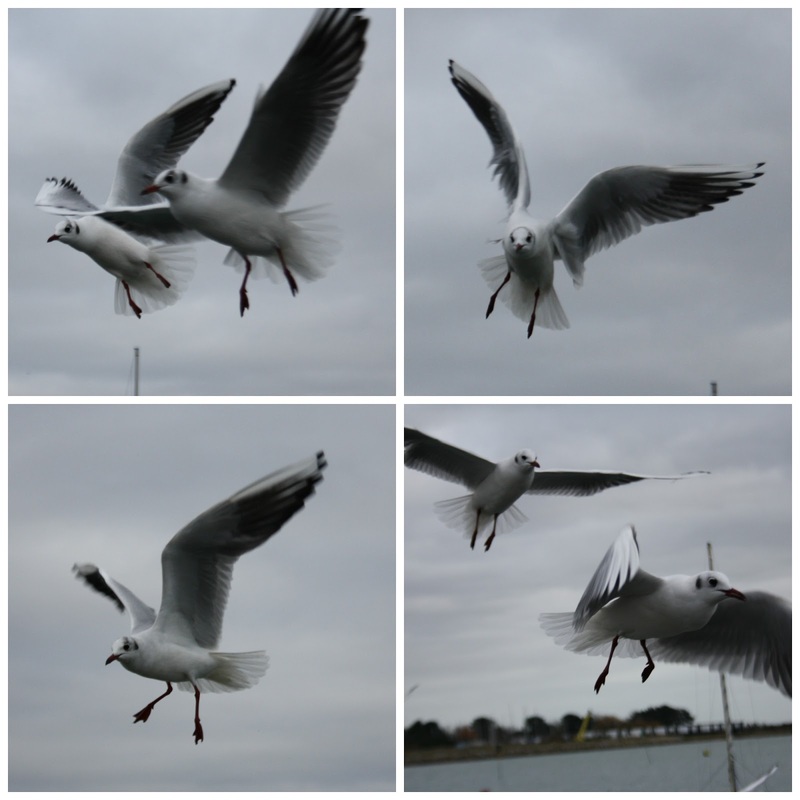 I spent a while trying to photograph the seagulls, like you do. We were feeding the ducks and the seagulls just descended. I felt safe behind the lens but, my word, they are not shy. Imagine one of them swooping down towards your bag of chips. Four hundred shots later I got one with a bird carrying a chunk of bread in it's beak. Hmm, that looks a lot like stale Kingsmill 50/50 to me. I watched Angus try to throw increasingly large rocks into the sea, some so heavy he could barely lift them before stumbling and dropping them about one inch away from his toes. I made Bella a head band. She chose the yarn, the pattern, everything. She's grown up so much lately. I'm not allowed to take her to her classroom door any more. She says bye at the school gate then saunters off. Some mornings I'm not even allowed to kiss her so instead I shout "Love you!" behind her really loudly as she walks away. I've dug out a embroidery I started last summer. It's going to be a wall hanging eventually. I like those triangles, the colours and shapes. I'm finding the stitching very soothing right now. I like to think about where I might eventually hang it when it's finished. I am continuing with my mission to find one good thing a day to celebrate throughout the month of January. It's still going well, I'm not struggling yet. My (self imposed) rules are that it has to be specific to winter, or as much as it can be, and have happened on that day. Otherwise it's cheating. I'm doing to the same on Instagram if any of you are on there. So, here is my third week. 16/31: I put the blanket on our bed again. So cosy in a bitterly cold week. 17/31: Hot chocolate. Really, it's small mug of hot chocolate with a lot of marshmallows. I like it when they melt and go all gooey. 18/31: The beautiful browns, greys and purples you see in the English countryside in winter. 19/31: Winter woollens, and buying luscious new yarn to make more woolly winter accessories. I've started a shawl. Yarn this fancy seemed to call for a shawl. 20/31: The most breathtaking sunrise. I have not tinkered with this photo in any way, these are the actual, glorious colours that I woke to on the morning of the 20th. I always think that the sunrises and sunsets we see in the winter months are our reward for living with the short, dark days. 21/31: There's still some Christmas cake left! We've eaten my dad's and now we're on to mine. I don't like marzipan or fondant icing so keep mine plain, and I also leave out the nuts and put in five times as many glace cherries as the recipe calls for. I love cherries in fruit cake, they're so sweet and sticky when you bite into them. Thank you for all your comments lately. I do so value your interest, support and friendship, and am very consicous that I've not been able to visit many of your blogs lately. I loved hearing your feelings and thoughts about walking (and replied to a few - some really good points and issues cropped up), and you were very kind about my scarf. It's been very cold here on the south coast all week, with some days barely getting above freezing, We've not had any snow though. I am resigned to the fact that, since we now live so near the sea, snow seems to be a once a decade occurrence, much to my disappointment. How about you - are you still coping with winter? Any snow in your neck of the woods? Stay warm this weekend. I was at a complete loss as for what to write this month since, as you know, we are between homes at the moment. While I feel at home here at my parents' house, it's not our home. Then, last weekend, we visited nearby Fort Nelson, a Royal Armouries museum: "Home of the Big Guns!" It was quite interesting if that's your thing - John, the kids and my Dad loved it. I wandered around thinking that all things military start to look very similar after a while until we came to two rooms, the mess and the kitchen. I stood in these rooms for ages, taking photos, leaning over the rope barriers, trying to take in the thoughtful restoration and exhibits. I think that, fundamentally, I am much more interested in how people live than how people kill each other. These rooms are not homes, but they were your nearest thing to home comforts if you'd been stationed in this fort as a soldier in the 1890's. The mess is the room the soldiers used to eat, socialise and, judging by this room, sleep in. Look at the long sash windows, and the little fireplace in the corner. That battered wooden trestle table and the benches, the gas lamp, the sepia photographs and pictures, the utilitarian crockery...well, they wouldn't look out of place in an interiors magazine of the pared down, home-spun style. Here is the laundry area. Oh, that scrubbed pine table and painted chair! The tin bath tubs and enamel sink, the washboards and wringer... it reminds me of one of those shops who specialise in reclaimed and salvaged vintage homewares. This is the kitchen area. 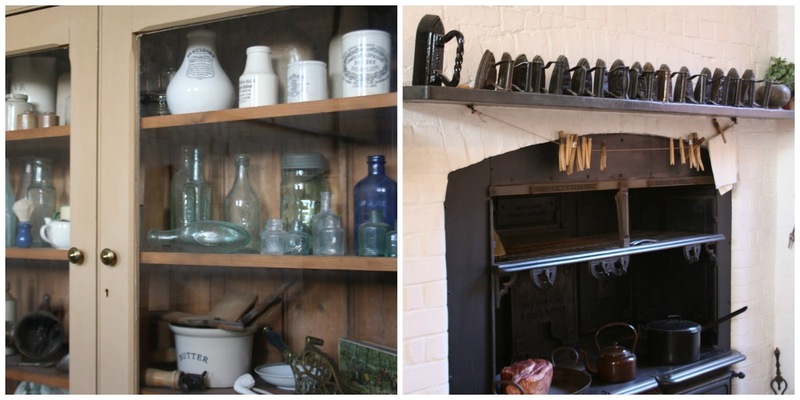 Note the beautiful dresser, full to bursting with glazed earthenware pots; admire the cast iron stove and saucepans (how heavy they must've been when full of water); admire the vintage clock and charming rocking chair. Now, I don't for one moment imagine the army kitchen looked anything like this when it was a working room, but I certainly appreciated the attention to detail in the representation that was on display. 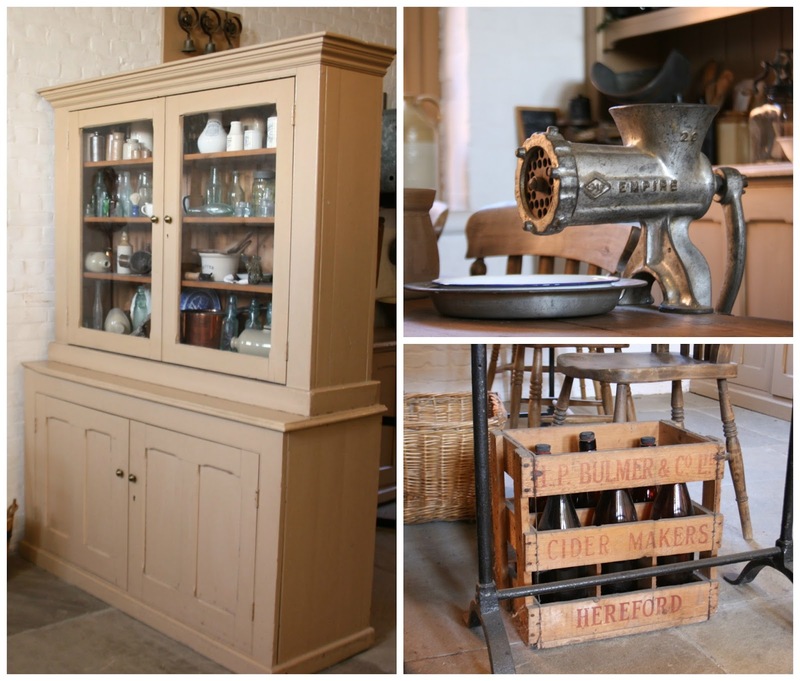 This style of plain, old fashioned kitchenware and furniture is very popular at the moment, and please don't think I'm mocking it - I love it as much as the next person. It's not very colourful though. But then these things weren't meant to be decorative, they were all about function: black, white, brown, cream, grey, (and the odd flash of copper, very "on trend"). And there lies the secret to their enduring popularity today - they are absolutely neutral. Whether your style is English Country, Modern Country, Rustic, Industrial, or "Scandi Chic" (I shuddered when I typed that), something from these rooms will no doubt fit in perfectly with how you choose to decorate your home. I do wonder if the people who once used these everyday objects would fall about laughing at the thought that someone might want to spend £10 on a battered, chipped enamel spoon in a gorgeous little shop, or pay £25 for an old wooden fruit or bottle crate. I think the less an item was considered valuable or covetable then, the more we seem to value and covet it today. Look at these earthenware pots below. I'm sorry about the quality of the photo, I had to zoom in quite a bit. I love these, love their warm colours and gently rounded shape. My mum has stacks of these pots. She's been collecting them for about twenty years because she likes them. Most are plain, some have writing on from when they held contents like ginger beer, and she has a jug which I seriously have my eye on. I've told her they're really popular at the moment and that, if she want's to err...refine her collection, then I'll happily home some of her rejects. Just as soon as I have a home of my own that is. And January's guest poster, Bee at the The Linen Cloud. Some months ago I watched my friend Rachel work on a v-stitch crocheted blanket and completely fell in love with the repeating zigzag pattern. It's easier than a ripple or chevron design, without any need for counting, but so effective and pleasing to the eye. Rachel referred me to the lovely (and new to me) blog Le Monde De Sucrette and Angie's pattern for her v-stitch design. 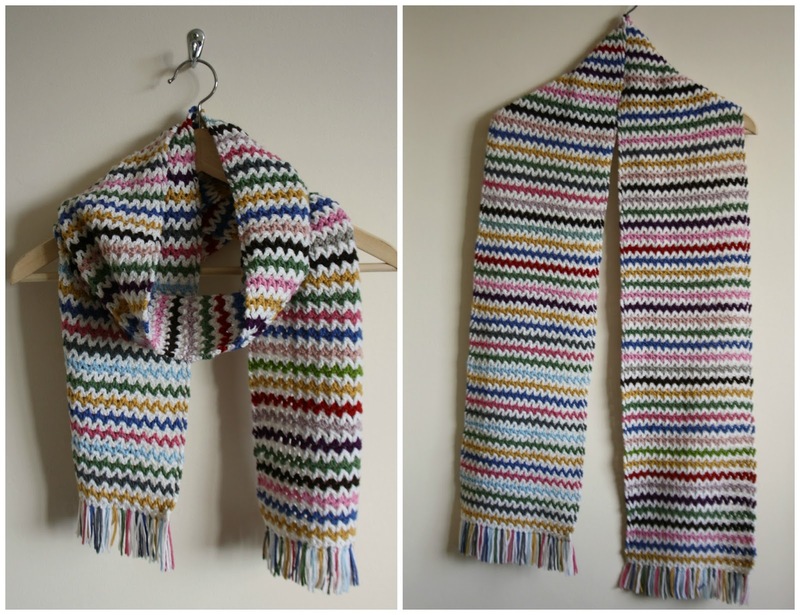 I didn't want to make a blanket, but I did have a bag of scraps and half balls of cashmerino yarn, and a yearning to make something cosy and mindlessly enjoyable over the Christmas period, and I thought it might be a good basis for a scarf. I decided to separate each row of colour with a row of white (partly to stretch my leftovers as far as possible) and I really like how this came out. It looks fresh and crisp. Although, I have to be honest, darning in the ends took as long as crocheting a row. I made it long, long enough to wrap all the way round my neck once then still knot loosely underneath. I kept thinking it was nearly there, but no...a bit further. The colours are supposed to look random but, let's not kid ourselves, you all know I worked out how much I had left of each colour and wrote out a chart. And then the question of whether to add a fringe or not. People suggested pompoms, but I didn't have enough yarn. I tried an all white fringe but thought it looked a bit boring. In the end I decided on a multicoloured fringe, using the six colours I had left with white between each, just like the scarf. I kept it short and neat and have to say I love how it came out. It is just fringe-y enough without being too long. It measures 94 cm or 37 inches long and 21 cm or 8 inches wide and kept my neck warm all day today. I don't have a name for it. 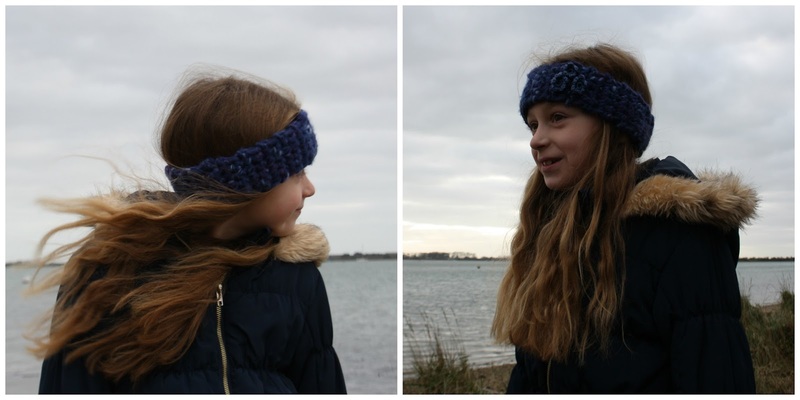 I am rubbish at naming things I make and can't think of anything beyond "my V stitch scarf". But I like how the colours have a bit of winter and spring in them, a sort of crossing over of the seasons. A reminder that spring is coming.